Guy Kawasaki has had a remarkable career, gaining notoriety first as Chief Evangelist at Apple followed by successful stints as an entrepreneur and venture capitalist. Given his background as a product visionary, when I had the chance to read his new book Enchantment (subtitled The Art of Changing Hearts, Minds, and Actions), I suspected it would yield the key to creating enchanting products. To my delight, it was so much more than that- it was in fact, more of a blueprint to a lead better life, and first and foremost, offer ways to positively change your own heart, mind, and actions. So, what is enchantment? In the opening of the first chapter, Kawasaki conveys a story where filmmaker Karin Muller, at the time stationed in the Phillipines as part of the Peace Corps, is warned that armed members of a militia Army group was coming to interrogate her. She defused the situation by showing hospitality to the interrogators, offering a cup of coffee as soon as they arrived. As she states, “you can’t interrogate someone you are having coffee with.” As Kawasaki explains, she delighted him with her hospitality and changed his heart, mind, and actions. That’s enchantment. 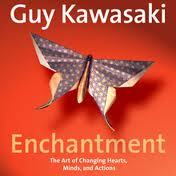 Kawasaki organizes the book by first offering enchantment techniques to apply to yourself, than to prepare and launch your product or message, followed by how to communicate and enchant your customers or audience, how to use today’s technology to enhance your personal or company brand, and finally on how to enchant your employees or boss. He uses many short sections in each chapter, with each section getting to the point quickly, often with key bulleted lists and real person examples. It was a very easy read, captivating the reader from the beginning to the end. For someone like myself working in the Internet industry with entrepreneurial instincts, it’s a valuable resource on how to build a personal brand. Given that he’s known for being a social media whiz, he does do a good job of showing how to use tools like Twitter, Linkedin, and Youtube to help build your brand and communication strategy but he doesn’t only focus on only those techniques. He talks throughout the book about the human touch- how to become trustworthy, how to follow up kindly, how to pay it forward, when to offer favors, etc. as even more important components of your personal brand strategy. Use checklists. I’m a big proponent of checklists and Kawasaki goes back to this tried and true technique throughout the book. Remember that the first follower is as often as important as the leader to get a movement started. He refers to the brilliant TED video by Derek Sievers to illustrate this point. You can see it here. Make it short, simple, and swallowable. E-mails- 6 sentences, Video- 60 seconds, Powerpoint- 10 slides, Business Plan- 20 slides. When you meet people (who may become your early followers or influencers), be prepared and know their interests. With tools like Linkedin, Facebook, blogs, you can generally easily find out what people’s interests are even before you meet them. Prime the pump- use some techniques that help with trial. An example he sited was a study done in a wine store; when French music was being played, it was more likely buyers would purchase French wine. Easy, immediate, inexpensive, concrete, and reversible– the keys to enable trial. Also, reducing the number of choices often leads to greater likelihood of purchase. Conduct a “Pre-Mortem”. I really like this one. Before a project or launch occurs, go through a brainstorming session where you list everything that could go wrong. Then indicate what’s in place to prevent those train derailing issues from occuring. Provide social proof for your cause. An extreme example- at funerals in many countries, women are paid to weep at the funeral creating greater social proof that the departed will be missed. Overall, a great read. Before I finished, I told my entrepreneur wife that she has to read this book. The first of Kawasaki’s books that I’ve read, I look forward to now reading some of his earlier works.